STAAD or (STAAD.Pro) is a structural analysis and design computer program originally developed by Research Engineers International at Yorba Linda, CA in 1997. In late 2005, Research Engineers International was bought by Bentley Systems.An older version called Staad-III for Windows is used by Iowa State University for educational purposes for civil and structural engineers.The commercial version, STAAD.Pro, is one of the most widely used structural analysis and design software products worldwide. 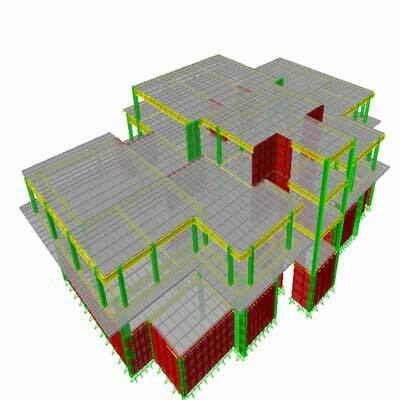 It supports several steel, concrete and timber design codes.It can make use of various forms of analysis from the traditional 1st order static analysis, 2nd order p-delta analysis, geometric non-linear analysis, Pushover analysis(Static-Non Linear Analysis) or a buckling analysis. In recent years it has become part of integrated structural analysis and design solutions mainly using an exposed API called OpenSTAAD to access and drive the program using a Visual Basic macro system included in the application or by including OpenSTAAD functionality in applications that themselves include suitable programmable macro systems. Additionally, STAAD.Pro has added direct links to applications such as RAM Connection and STAAD.Foundation to provide engineers working with those applications which handle design post processing not handled by STAAD.Pro itself. It is capable of analysing and designing civil engineering structures such as buildings, bridges, plane and space trusses. It can generate loads (wind and earthquake) as per building codes of selected countries. It can carry out design of steel and reinforced concrete buildings as per codes of selected countries. It can carry out linear elastic (static and dynamic) and nonlinear dynamic analysis (although I am not sure how good the nonlinear analysis algorithms are, not having used those features). You will know how to carry out flexible zoom and multiple views. You will know how to have isometric and perspective views and 3D shapes. You will know how to use built-in command file editor and simple command language. You will know how to generate graphics/text input. You will know how to do efficient algorithm that minimizes disk space requirements. You will know how to take presentation quality printer plots of geometry and results as part of run output. You will know how to perform accurate and numerically efficient plate/shell element incorporating out-of-plane shear and in-plane rotation; automatic element mesh generation; comprehensive element stress output including in-plane stresses, out-of-plane shear, bending and principal stresses at nodal as well as user specified points. You will learn how to achieve user-specified design parameters to customize design. You will know how to design concrete beams/columns/slabs/footings as per all major international codes.